Media captionWould you be happy being interviewed by a robot? The world's first robot designed to carry out unbiased job interviews is being tested by Swedish recruiters. But can it really do a better job than humans? Her name is Tengai. Measuring 41cm (16in) tall and weighing 3.5kg (7.7lbs) she's at eye level as she sits on top of a table directly across from the candidate she's about to interview. Her glowing yellow face tilts slightly to the side. Then she blinks and smiles lightly as she poses her first question: "Have you ever been interviewed by a robot before?" Tengai is the brainchild of Furhat Robotics, an artificial intelligence (AI) and social robotics company born out of a research project at Stockholm's KTH Royal Institute of Technology. The firm has spent the past four years building a human-like computer interface that mimics the way we speak, as well as our subtle facial expressions. The idea, according to chief scientist Gabriel Skantze, is that "it feels much less scary or strange compared to a more traditional robot". Since October 2018, the start-up's been collaborating with one of Sweden's largest recruitment firms, TNG. The goal is to offer candidates job interviews that are free from any of the unconscious biases that managers and recruiters can often bring to the hiring process, while still making the experience "seem human". "It typically takes about seven seconds for someone to make a first impression and about five to 15 minutes for a recruiter to make a decision. We want to challenge that," explains Elin Öberg Mårtenzon, chief innovation officer at TNG's office in central Stockholm. Unconscious biases include making assumptions about someone's competence based on gender, ethnicity, voice, education, appearance, or as a result of informal conversations before or after an interview. "For example, if I ask you a question at the beginning of the process like: 'Do you play golf?' and you say: 'Yes I do, I love playing golf', and I do too, then in some way I will put that in a positive box," says Ms Mårtenzon. Tengai, by contrast, doesn't engage in pre-interview chit-chat and poses all questions in an identical way, in the same tone, and typically, in the same order. This is thought to create a fairer and more objective interview. Recruiters or managers are then given text transcripts of each interview to help them decide which candidates should move to the next stage of the process, based on the answers alone. "I think it is a really good help while screening - if you have a big recruitment process with a lot of candidates - having someone, a robot, with no emotions, no feelings," says Petra Elisson, a 50-year-old who works in healthcare recruitment. She has been taking part in the trials, both as a recruiter analysing candidates transcripts and as an interviewee. "I was quite sceptical at first before meeting Tengai, but after the meeting I was absolutely struck," she reflects. "At first I really, really felt it was a robot, but when going more deeply into the interview I totally forgot that she's not human." But robots are programmed by humans, analyse datasets compiled by humans, and learn from human behaviour, so couldn't they inherit some of our biases? Furhat Robotics says it has sought to stop this by carrying out multiple test interviews using a diverse pool of volunteers. "It's learning from several different recruiters so it doesn't pick up the specific behaviour of one recruiter," explains the start-up's chief scientist, Gabriel Skantze. Following several months of trials, Tengai will start interviewing candidates for real later in May. Recruiters and developers are also working on an English-language version of the robot which is expected to be rolled out by early 2020. The goal is that she will eventually be sophisticated enough to decide for herself whether a candidate can move forward to the next stage of recruitment, avoiding the need for a human to review interview transcripts. "Before we completely rely on that, we have to make sure that there is no bias in our data," explains Mr Skantze. Sweden does offer an especially interesting test bed for AI recruitment. As well as being a small country with a reputation for early adoption when it comes to new technologies, ethnic diversity in the labour market is a particularly hot topic following record immigration in recent years. Unemployment among native Swedes is around 4%, but for citizens born abroad the figure is more than 15%. Compare that to the UK, where 5% of foreign-born citizens are without a job. A recent survey for TNG suggested that 73% of job seekers in Sweden believe they have been discriminated against while applying for a job on the basis of their ethnicity, age, gender, sexual preferences, appearance, weight, health or disability. "Swedish culture is very risk-averse, so normally they like the safe card... the Swedish person," says one Bulgarian job seeker who wants to be known only by her first name, Ekaterina, waiting outside a city centre employment agency. 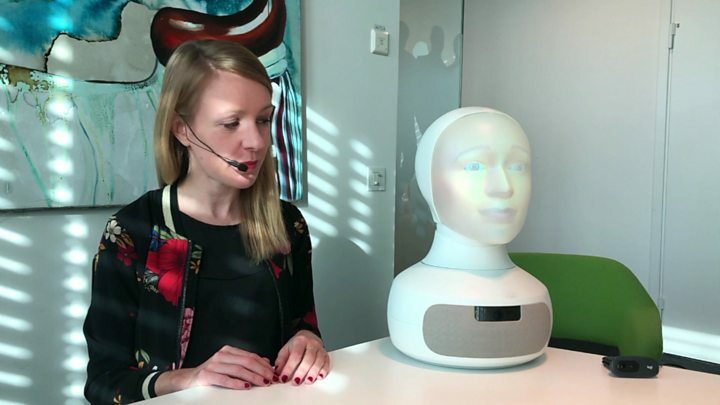 Ekaterina believes robots such as Tengai could be "great as a first step" in the recruitment process, because they "don't have any stereotypes about your dialect or accent or where you come from". The technology has also been championed by Diversity Foundation, a non-political, non-profit organisation that campaigns for more inclusion in the Swedish labour market. "Any method that emphasises competency and skills over things like ethnicity is a welcome development and truly part of the Swedish innovation spirit," says chief operating officer Matt Kriteman. A growing number of AI tools and technologies are being tested around the world in the field of recruitment. Among the most high-profile is HireVue, a US-based video platform that enables candidates to be interviewed at any time of day and uses algorithms to evaluate their answers and facial expressions. Seedlink, which has offices in Amsterdam and Shanghai, asks candidates to answer questions on their smartphones, and analyses their language to see if they're the right cultural fit for a role. And UK start-up JamieAi focuses on matching candidates with the right credentials for relevant job openings, seeking to eliminate bias by excluding demographic factors, such as name, age or ethnicity. Swedish recruiter TNG says interviewees have enjoyed their encounters with Tengai. But some professionals have concerns. Dr Malin Lindelöw, a Swedish psychologist who specialises in recruitment, says: "Recruiting is very much a leap of faith. It's a huge investment. It's a huge commitment. And you need to believe in the decision that you make. "I find it very difficult to believe that recruiting managers will rely on a robot." She also points out that interviews - especially those in sectors where there is a skills shortage - can be as much about job seekers deciding whether or not they want to work for a company as the reverse. "The candidate will come to the interview thinking: 'Is this a place where I want to work? 'Is this somebody I want to work with?' They get their own gut feeling and it will affect their decision a great deal," she says. "I am very concerned about what robots may do to that part of the process."